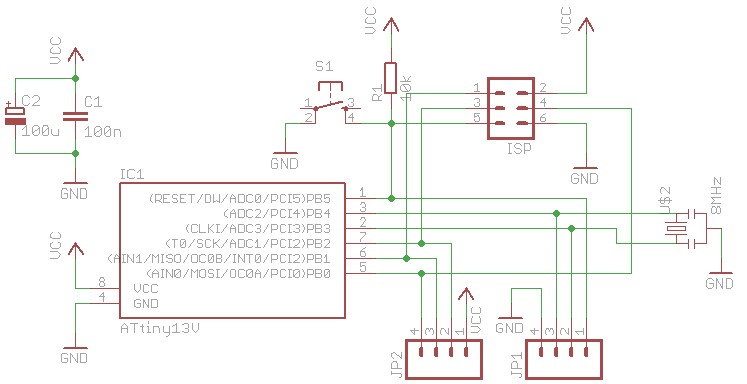 The schematic for this header board is rather simple. 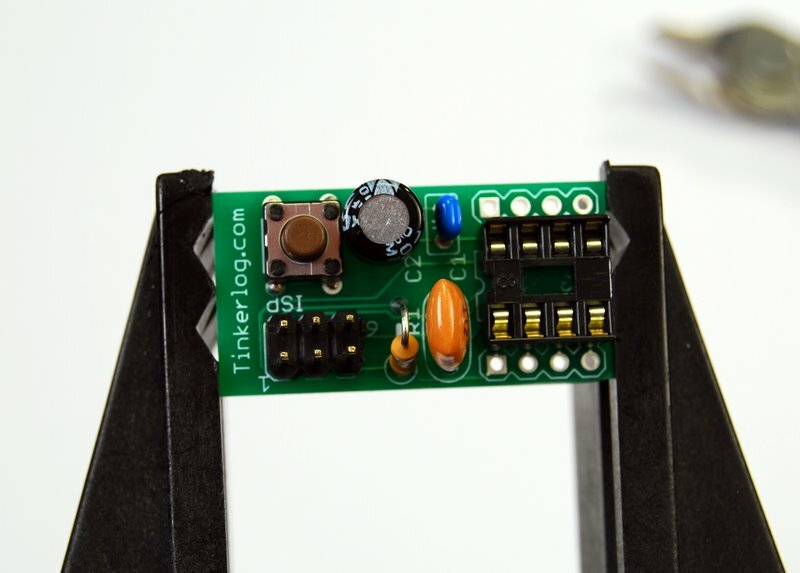 The component count is low, so you can even build it on a perfboard. 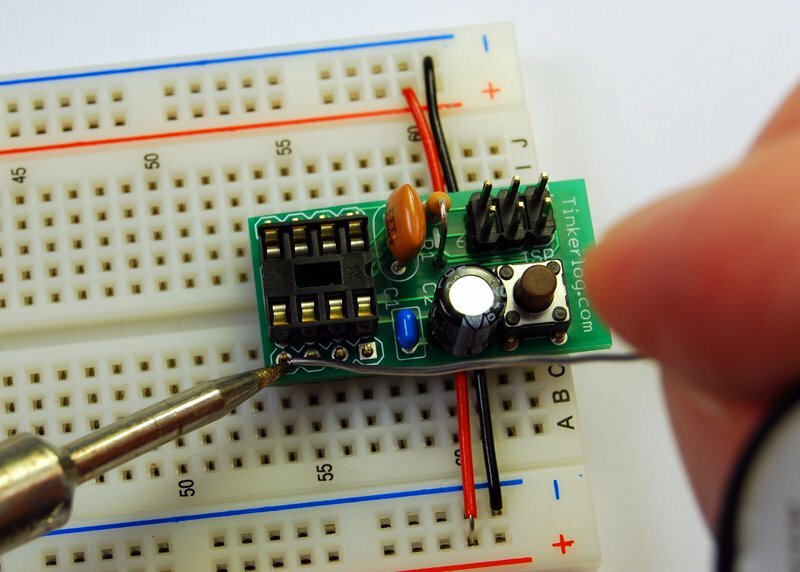 You can replace the ATtiny25 with every 8-pin AVR microcontroller, e.g. 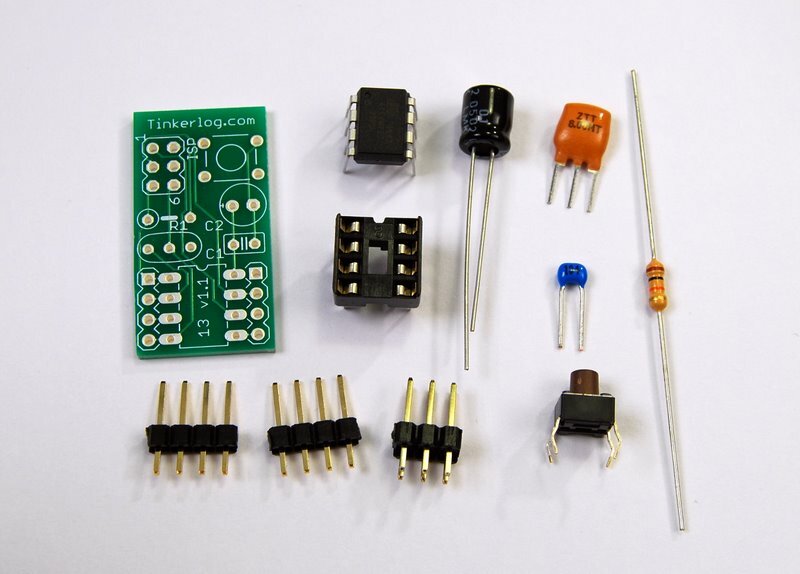 ATtiny45 and ATtiny85. 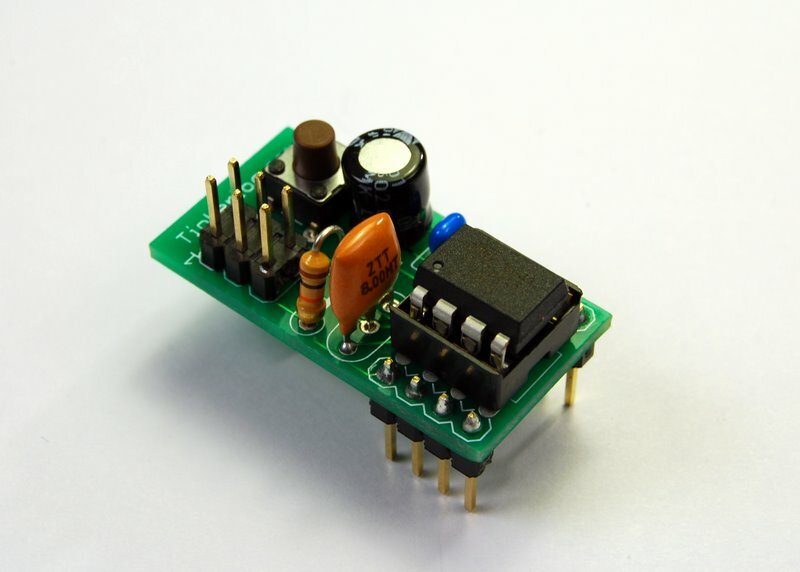 The smaller devices as ATtiny13 work as well, but can not use the external resonator. The resonator can be replaced with different speeds as well. First insert the 100n capacitor and the 10k resistor. Bend the legs a bit to prevent that the components fall off, if you turn the PCB. Now solder the capactor and the resistor. 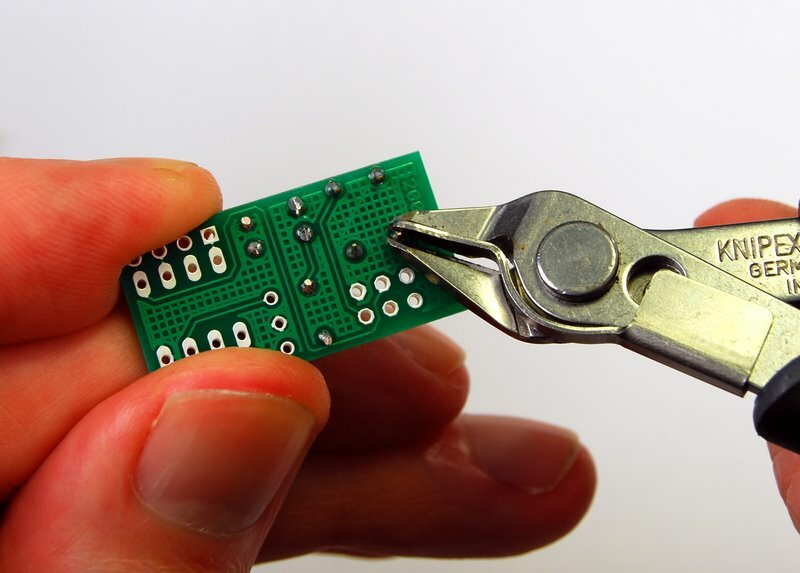 Use the diagonal cutters to cut off the leads. Next insert the button and the electrolytic capacitor. 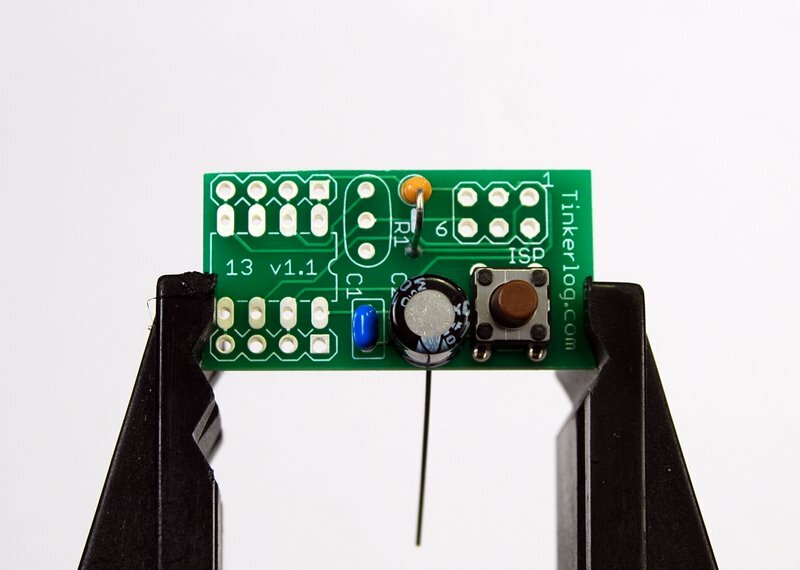 The 100u capacitor has a positive and a negative leg. 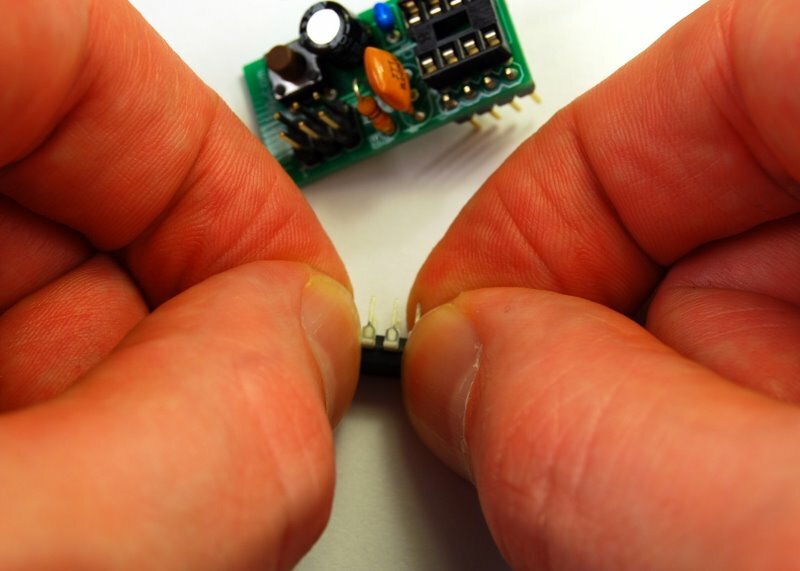 There is a small plus sign on the PCB to show you how to insert the capacitor the right way. Solder the capacitor and the button. Insert the resonator. Orientation does not matter for this part. Insert and solder the 6-pin programming header. Next insert the 8-pin socket. Check, that the small notch points towards the ISP header. 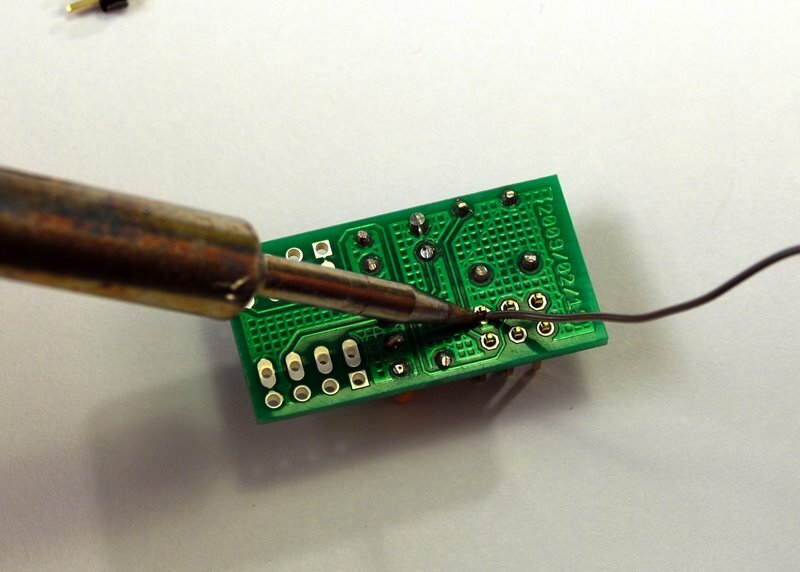 Now solder the socket. 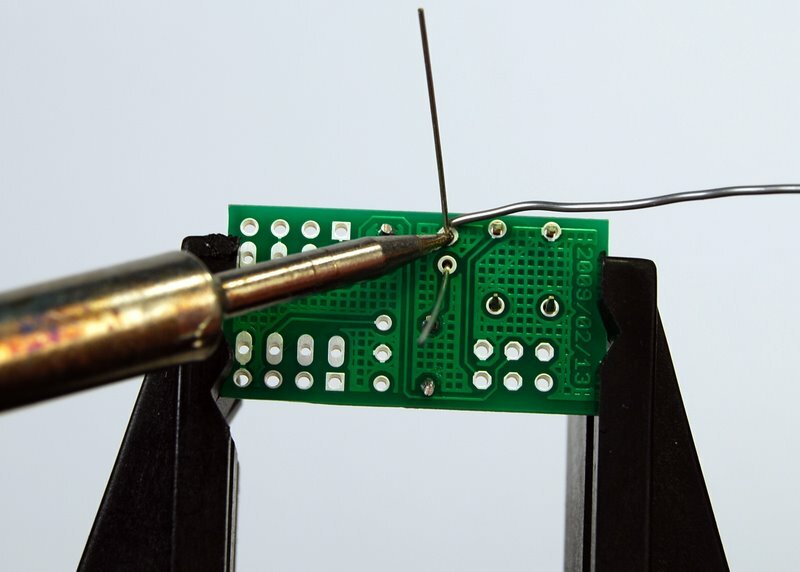 For easier soldering you can insert the 2 4-pin header rows into a breadboard. Then simply put the PCB on top. Maybe you have to adjust the PCB a little to be sure to have it sitting flat on both pin headers. 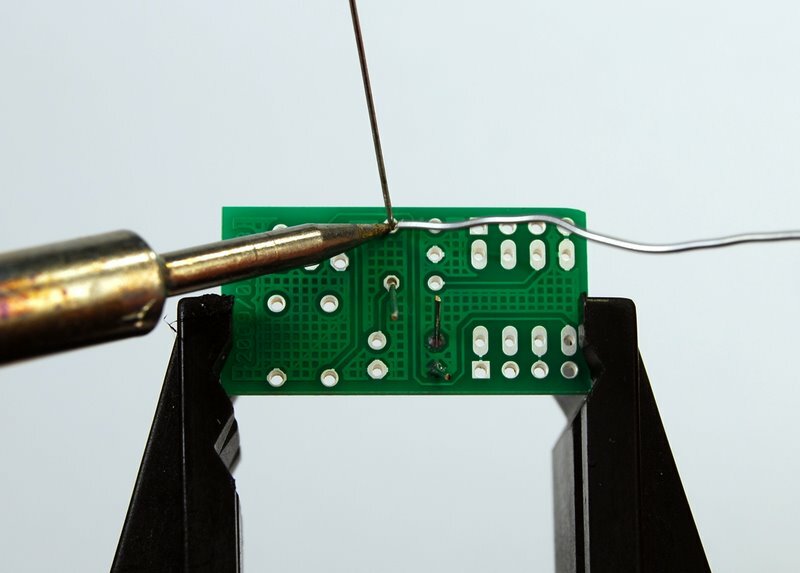 Last part to solder. You are almost done. 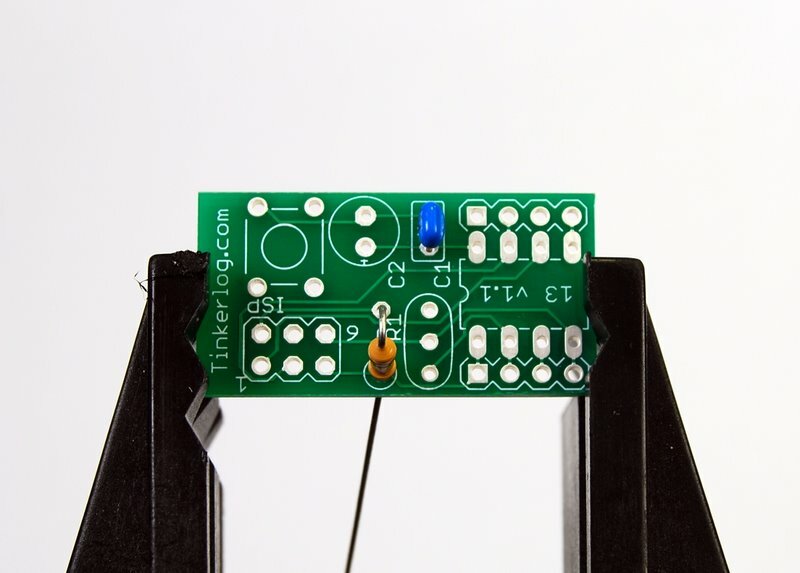 To insert the microcontroller, you have to bent the legs of the controller a bit. Put the controller with one side flat on your desk and bent the legs slightly. Turn the controller around and do it again. My fingers are a bit fat, but I think you get the idea from the picture. Insert the controller with the tiny circle facing towards the notch of the socket. Ok, now connect your ISP programmer cable. 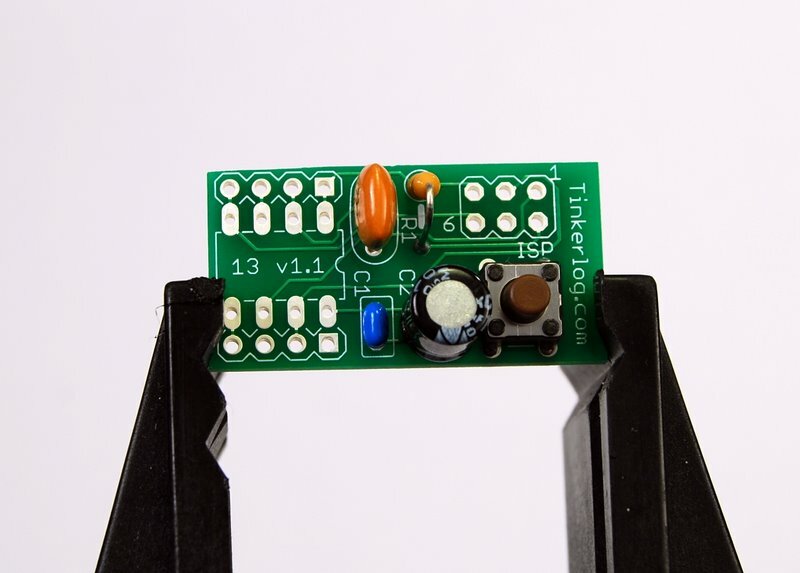 There is small 1 on the PCB to show you how to connect the cable. My programmer (USBtinyISP) has a red cable, that denotes pin 1. 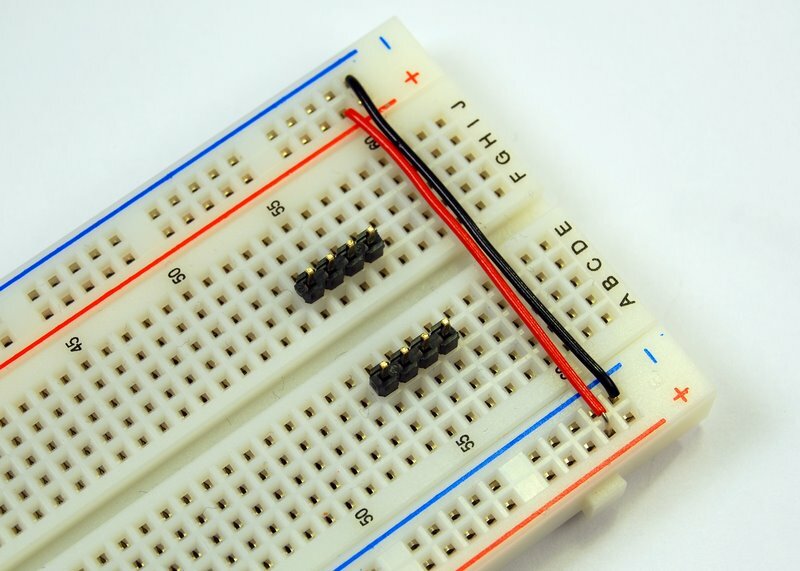 Put an LED and a resistor on the breadboard for final testing. Power is supplied through my programmer. Check if your programmer can do the same. If not, you have to attach a 5 Volt power supply. Unzip the source files and adapt the makefile to your needs, e.g. 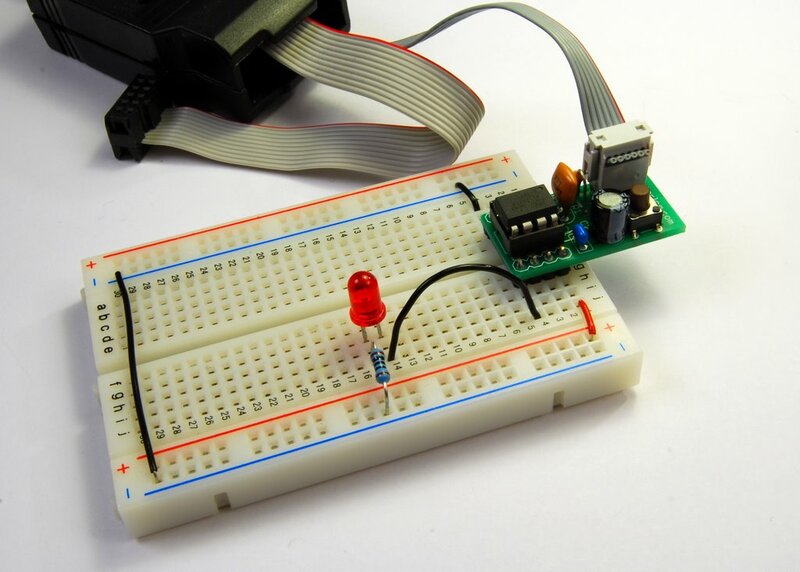 configure your programmer and adjust the FUSE settings, if you use another than the standard 8 MHz resonator. Then type make, make fuse and make flash. You should see the LED blinking once every second. Now you’re ready for faster prototyping. Enjoy.